Revived by paramedics and kept alive by doctors, Angie (Jordan) Dahlgren (G95, MAT96) says her medical nightmare is one she will actually celebrate this spring. She’s planning to commemorate the occasion with her cardiologist on May 21, 2015, the 20th anniversary of the day she was just seconds away from death. Just days after completing her senior softball season at George Fox in 1995, Dahlgren suffered cardiac arrest on her way back to her apartment after a workout in Wheeler Sports Center. The irony is it was the result of a heart condition called hypertrophic cardiomyopathy – a condition Dahlgren had written a class paper on just weeks before. It is the leading cause of sudden death in young athletes, caused when thickening of the wall between the two pumping chambers of the heart prevents the heart from getting the blood it needs. Today, Dahlgren says that knowledge helped get her through the tough times that immediately followed. During her immediate treatment and recovery, Dahlgren was told she would have to avoid strenuous workouts for the rest of her life. No more weightlifting. No more running. That was a hard reality for the multi-sport athlete to imagine. “In my mind, I’m thinking there’s a point where I’ll get back to being my active self,” she said at the time. She was right. Today, at 41, Dahlgren is working full time, raising a child with her husband, Denny, living in a house with stairs, and playing softball, not just in the summer but nine months a year. She’s under no restrictions and takes just one medication. She checks her heart rate during games and benches herself if she feels it’s necessary. And, once a month she uses a home medical kit to measure her blood’s clotting rate in order to keep it stabilized. Getting to this point has not been easy. She has had eight heart surgeries, has a heart defibrillator installed, and has had open-heart surgery to install two mechanical artificial valves – one aortic, one mitral – and a ring placed on her tricuspid valve. The last new defibrillator surgery was in 2008 and required nearly a year of recovery. Then, in June 2010 she had another surgery to repair a broken lead wire in the defibrillator. She will have a defibrillator the rest of her life, with a replacement every seven years. Another test came during her pregnancy in 2007. The first three months of the pregnancy were normal, but continuing complications, exacerbated by heart-related problems, forced home rest and hospitalization for months until little Keeley arrived on Dec. 10, 2007, nearly two months early. She weighed just 3 pounds, 12 ounces, but was completely healthy. Dahlgren’s medical journey was not yet over. Last June, she was diagnosed with breast cancer and underwent a double mastectomy in August, followed by six weeks of radiation, then reconstructive and other follow-up surgery. Her treatment now done, she is on medication and will have checkups every three or four months. Throughout her repeated health ordeals, Dahlgren has continued to work. After graduation, she was a substitute teacher in Newberg and later Portland for eight years. For the last 11 years she has been a marine services officer with the Port of Portland, working as a dispatcher, office manager, and at the gates controlling access to the huge port. 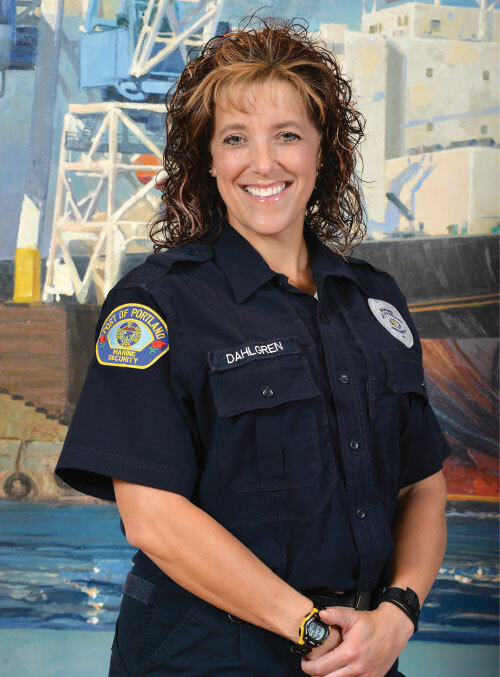 Dahlgren was also elected to head her union’s negotiating team with the Port of Portland. In November of 2012, she was in the news as a spokesperson when a tense, late negotiation session ended with a four-year agreement that expires this June. She already anticipates being involved again. As for the medical struggles she has experienced, Dahlgren says she has always felt a sense of calm knowing that God was in control.